Some ad copy just brings out the best in me. Then again, I would think any ad that using an image of a child and a reference to a gun...funny. See if you can guess the product. Those Quaker Oats! This ad was from a religious magazine from 1914. Click the image for a read-able version. They look like pistachios. Not sure what shooting them from a gun would do. I live about 25 miles from the old Quaker Oats factory over in Akron Ohio, and had the opportunity to tour it many years ago. It was converted to a really unique boutique-type shopping destination and after a few decades, has been re-imagined into the new Quaker Square Inn at the University of Akron. 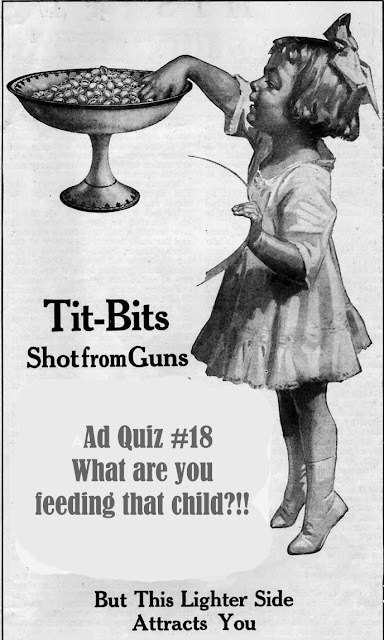 I found an article that explains the hugely successful "shot from guns" ad campaign, that started in 1913 and increased Quaker's sales by more than 30-fold. Look for the 2nd sub-heading called "So What Is Needed To Pop These Grains?" Quakers, shot from guns, I don't know, something doesn't compute!